Dominion Resources, Inc. (NYSE: D), has announced that, subject to the scheduled close of today’s sale of approximately $200 million of its common stock through a registered underwritten public offering to UBS Securities LLC, it has completed its currently planned market issuances of equity for calendar year 2015. With today’s offering and the previously completed “at the market” issuances of common stock during this year of approximately $300 million, the company has completed $500 million in market issuances of new equity in 2015. The company has no current plans to issue to the market any additional shares of its common stock or other equity-linked securities this year. 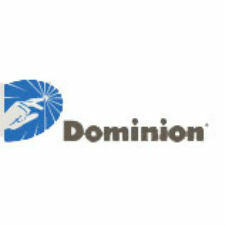 Dominion is one of the nation’s largest producers and transporters of energy, with a portfolio of approximately 24,600 megawatts of generation, 12,200 miles of natural gas transmission, gathering and storage pipeline, and 6,455 miles of electric transmission lines. Dominion operates one of the nation’s largest natural gas storage systems with 928 billion cubic feet of storage capacity and serves utility and retail energy customers in 13 states.